For an affordable kitchen scale which provides accurate readings and offers an array of excellent features, the Ozeri ZK14-AB Pronto Digital Kitchen Scale is a solid model worth considering. Indeed, it was used as part of a scientific research study by the Harvard Medical School, which is a testament to its accuracy. I decided to give it a try myself; here are my findings. Tare Button: This is a convenient feature which allows you to set the scale back to zero after adding an empty dish or vessel. That way you can weigh the food you put inside without weighing the dish. Auto-Off: If you do not use the device for two minutes, it turns itself off automatically. Automatic Unit Button: With this feature, you can convert between different units. Indeed, one very useful option is the “ingredients by weight rather than volume” conversion. Choose from a variety of colors. Most kitchen scales come only in one or a couple of neutral tones, but you can order this one in a wide variety of colors (red, teal, green, silver, etc.). Battery life is long. I used mine every day for well over a month before I had to change mine. Easy to clean. A quick wipe-down is all it takes to keep the surface clean. Tons of great features. The unit conversions, tare function, auto-off, and big LCD screen all combine to make this a great purchase. Not as compact as some other models. To be clear, it is a small, portable, lightweight scale, but it is not flat like a lot of other models. I would say whether the design is a pro or a con for you depends both on your aesthetic preferences and on where you want to store it. There might be some issues with quality control. There were several customers who said that they had problems with fluctuating or inaccurate measurements. My own model was very accurate and consistent so I think this is a rare issue. One buyer mentioned returning their malfunctioning scale on warranty for a replacement and being very happy with the new unit and the customer service. I would say that this is an all-around great choice if you want a kitchen scale which does it all for a reasonable price. Just keep in mind that it is not the slimmest option. 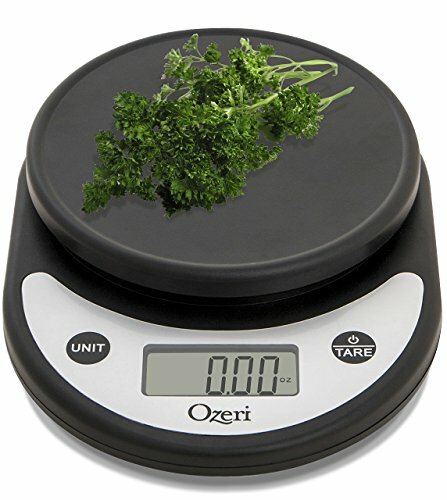 If you want a reasonably priced food scale which is renowned for its accuracy, ease-of-use and handy features, think about buying the Ozeri ZK14-AB Pronto Digital Kitchen Scale. This is a hugely popular model with over 12,000 customer reviews and a strong average rating. Having explored the model and tested it out and had a great experience doing so, I can see why it has earned such a stellar reputation in the food prep community. Give it a try.